The humanities and social sciences make an important contribution to a range of contemporary research questions and problems. Most current social, cultural and economic questions necessitate cross-disciplinary understanding. Emerging fields such as life sciences or the cognitive sciences, in particular, benefit from insights and methodological approaches from the humanities and social sciences. 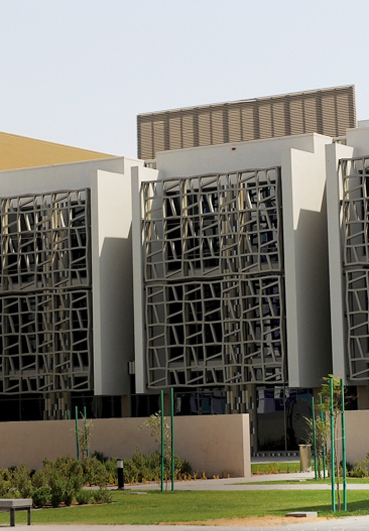 UAEU is currently ranked among the best 400 universities in the world and is internationally accredited by WASC Senior Colleges and Universities Accrediting Commission. Our professors have graduated from highly reputable international universities, many ranked in the world top 100. 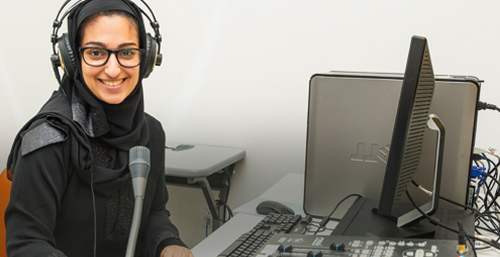 We have some of the most up-to-date linguistics laboratories in the Middle East, including EEG, phonetics, and psycholinguistics laboratories and a multi-million dirham TV studio. Many of our graduates receive posts that involve regular international travel and some of our students travel overseas during their studies to take up internships. We offer minors in three languages: French, Korean and German. This gives you an advantage in the job market if you have learned a third language. No prior knowledge of these languages is required. If you choose to study a humanities or social sciences degree, you will acquire analytical, critical thinking, problem-solving and communication skills. These abilities are highly sought after in both the corporate and private sector. Owing to the fast-changing nature of technological innovation, the ability to process large quantities of diverse data into a clear, economical and effective argument (a central feature of a BA course), is more in demand now than ever before. Many of our departments organize field trips and extra-curricular activities to optimize our students’ university experience. 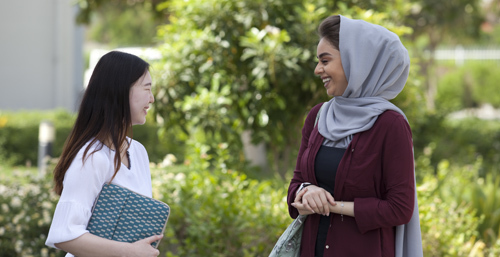 UAEU has partnered with some of the Emirates’ leading institutions and companies so that you will benefit from real-world experience before you graduate. Our goal is not only to give students an excellent degree qualification but also to ensure that you have fun along the way. Our students come from more than 60 countries, so you will interact with and learn from people of diverse cultural backgrounds. The university offers a wealth of extra-curricular activities and life-enhancing experiences with more than 50 Clubs and Societies. Workshop on "Innovate with Robots"
Many people talk about mapping out their career. For Dr Naeema Al Hosani, that takes on a more literal meaning. An established cartography scholar, she is an expert in the science or practice of drawing maps, and now brings that knowledge to UAEU students as Chair of its Department of Geography and Urban Planning. 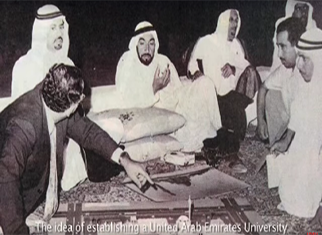 But her role within the university – and within UAE life – has a much wider compass. With her areas of research interest including cartography, geographic information systems, remote sensing, the environment, tourism, and education, Dr Al Hosani – who is also Assistant Dean for Student Affairs within UAEU’s College of Humanities and Social Sciences – initially joined the Al Ain university as an Assistant Professor, having completed her MA and Ph.D. at the University of Kansas. Since arriving at UAEU, she has been heavily involved in scholarship, teaching, and service, in addition to holding senior administrative positions at departmental, collegial, and university level, including chairing and being a member of numerous committees. Her professional life has two aspects. On the research side, she has a high-caliber publications record – as a single author and a co-author – with her work being published in top-ranking Western academic journals and her experience and insight seeing her make presentations at domestic, regional, and international conferences. Dr Al Hosani participated in the transfer of groundbreaking Western research to an Arab audience by translating significant, globally-important books in her area of specialization. The outstanding nature of her research has led to her winning many grants and being awarded prominent accolades, including the UAEU Award for Distinction in Research, as well as being honored by the UAEU Provost for her publication record. In the teaching field, Dr Al Hosani has carved a reputation for reliability, resourcefulness, and dynamism, as an excellent planner and organizer, and for her dedication to creating a vibrant learning environment. Her approach is based on interactive teaching strategies, inquiry-based learning, nurturing students’ individual passions and curiosity, and integrating IT into the educational process. Describing her role in the classroom as being “a facilitator and guide in a challenging adventure designed to foster collaboration, discourse and discovery”, she has played a pivotal part in curriculum development and learning outcomes assessments at UAEU. Her academic work recently led to her receiving the UAEU Award for Excellence in Teaching, 2017, and the Prestigious Khalifa Award for distinction in teaching, recognition that follows many other awards from international organizations. Dr Al Hosani’s stature and expertise has seen her make a valuable impact to enriching knowledge and opportunity across UAE society. 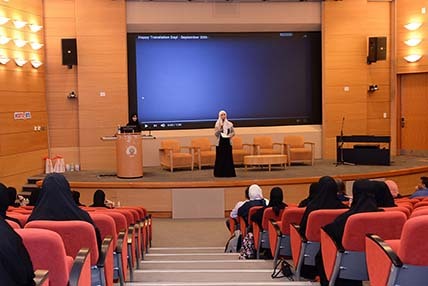 She has participated in an array of events and seminars dealing with pedagogical issues, within UAEU and in the wider community, and served as mediator between the College of Humanities and Social Sciences and a number of UAE companies and institutions to provide training openings for UAEU students. Her impressive community service record includes cooperation with local universities and government bodies, such as the Ministry of Education, the Ministry of Youth and Culture, the Ministry of Tourism, the Ministry of Presidential Affairs and the Ministry of the Interior. 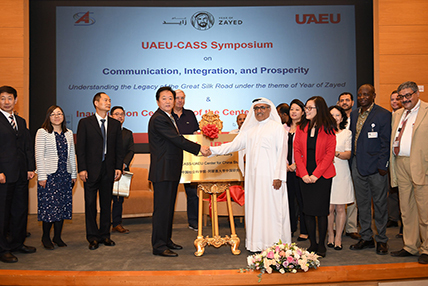 And she has established many cooperation initiatives aimed at strengthening connections between UAEU's academic community and wider UAE society, by establishing avenues of dialogue, outreach, and knowledge exchange. Away from the UAEU, Dr Al Hosani has many hobbies and enjoys spending her downtime reading novels and discovering new recipes to cook in her kitchen. Badreya Al-Jenaibi is a full-time professor in Mass Communications at the United Arab Emirates University. She gained a Ph.D in Public Relations and Mass Communication from the University of North Dakota (USA) in 2008. Previously she received a Master’s of Art in Mass Communications from the University of Northern Iowa (also in the USA in 2004). In addition, she won the H.H. Mohammed Bin Zayed Award for outstanding students. Her research interests include pedagogy, international communications and public relations, as well as the effects of both mass media and new media. She has published 43 articles in peer-reviewed journals in a variety of countries (USA, Canada, England, etc.) Theses publications include the Journal of Applied Journalism and Media Studies, the International Journal of Information Systems and Social Change, the International Journal of E-adoption, the Global Media Journal and the Journal for Communication and Culture. She is a member of the editorial board for a total of 18 peer-reviewed journals. 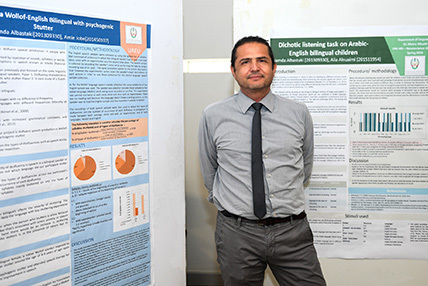 Professor Al-Jenaibi has received 24 local and international awards. These include the H.H. Hamdan Bin Rashed Al Maktoum Award for best teacher in the UAE in 2017; the Khalifa Award for best professor in the UAE and Arab region. She has also been the recipient of the Best Teacher Award at UAEU and the H.H. Shamsa Bint Sohail Award for the most creative teacher. Additionally, Professor Al-Jenaibi has been judged as an Outstanding Woman Achiever in Mass Communications and Teaching. Other awards include the H.H. Hamdan Bin Mubarak Award for the best employee in a highly specialized jobs (academic level). Locally, she has won the UAEU Community Service Employee Prize as well as being the most active professor in terms of publication. This is in line with winning her college’s award for research and publishing and the Rashid Award for Academic Excellence. She is founder and voluntary director of the Mubadrah Student Community Engagement Center, which works with 114 local organizations. She is also heavily involved in charity campaigns, fundraising, other exhibitions and in working with local organizations. One of her initiatives was the ‘Let's Read, Volunteer and Innovate’ Program. Professor Al-Jenaibi has attended more than 33 conferences and taught on 27 different courses. Her teaching philosophy is innovative and she is always keen to develop her teaching skills. She likes to travel and took a sabbatical from 2014 to 2015, to go to Beijing, China. Her other hobbies include drawing.